Attaining Gold Rewards status on T-Mobile Prepaid plans means you get good rates on pay as you go plans on feature phones for year long service. For your smartphone, you can check out the unlimited plans. T-Mobile has stopped offering two-year contracts. Instead of subsidizing the cost of the phone by locking you into a contract, they now let you pay for your phone on an installment plan instead, however, if you leave, I think you have to pay the outstanding balance. They still maintain a separate prepaid plan where you pay for the phone up front. One advantage of these plans is that there is no credit check and no additional fee. You can take these phones and activate them on other compatible plans. Monthly plans range from $30 to $80 per month depending on the amount of high-speed data you need. All these plans offer unlimited text (including international text) and data. You get unlimited text and data (including up to 5 GB high-speed data! ), but you only get 100 voice minutes. This is probably a great plan for teenagers who mostly text and rarely talk (on the phone that is). You have to activate your device with T-Mobile online or at a Walmart to be able to sign-up for this plan. As a comparison, Kajeet, the cell phone plan for kids has a unlimited texting plan for $14.99 a month that also includes 60 voice minutes, you have to pay extra for data. This is designed for children who send more texts than make calls, but allows for a few calls without having to spend more than $15 per month. The $80 per month plan gives you unlimited talk, text and data (including unlimited high-speed data). The plans in-between these two extremes offer varying amounts of high-speed data to go with unlimited talk and text. There is also a Simple Starter plan wedged in there at $45 per month that include 2 GB of high-speed data. The Pay by the Day plans are very similar to GoPhone and Verizon plans. You are charged $2 or $3 on the days you use your phone depending on whether you want access to 200 MB of high-speed data or are willing to settle for slower 2G data. You balance is deducted on the days you use your phone. With the Pay as You Go service, your cost per minute depends on which prepaid refill cards you buy. You get about 10 minutes when you activate - after that you have to add airtime. All of these prepaid plans are available with their prepaid starter kits. Refill cards come in denominations for $10, $25, $50 and $100 dollars, with the last one being the best value. $100 for 1000 minutes (10 cents per minute) expiring in one year. So for $100 plus the cost of the phone, you get 1000 minutes good for one whole year. With a $3 per month plan, you get 30 minutes or texts and you make sure that you keep your phone number and service active. This is one of the lowest monthly rates available if you just want to use your phone for emergencies. You receive bonus minutes once you buy the $100 airtime refill card or any combination of $100 in airtime refills. This gets you Gold status and a 15% airtime bonus. Refill cards are available all over the place: at convenience stores such as Circle K and 7-Eleven, pharmacies like Eckerd and Walgreens, and superstores like Walmart, Costco and Office Depot. You can also go direct to T-Mobile to refill your airtime online. The best deal is the $100 one-year card directly from T-Mobile or from a retail store. You get 1000 minutes spread out over a year for $8.33 a month. You can check your airtime balance from your phone by calling #999# from your handset. You will get a free text message back with your airtime balance. You can also dial 1-877-778-2106 from any touch-tone phone. You can also login to your online account and check your balance there. Messaging options include text messages, picture messages and instant messaging. Text messages cost 10 cents to send and are free to receive. Picture messages cost 25 cents to send as well as receive. Most phones are compatible with Yahoo, AOL, MSN and ICQ instant messaging services. You are charged for airtime when you use these services. You can keep your number if you refill your account within 90 days after your minutes expire. This is really good. Other plans recycle your number pretty quickly. You can even buy minutes online for someone else, a convenience if you've got children away in college or summer camp. Phones available range from a basic flip phone, to smartphone starting at $95 for a ZTE Zinger to an iPhone 5S for $595. These prices include the SIM card and $30 airtime card. The support rep was nice enough and straight-forward, but I wasn't that happy with the answer. I guess one should just consider it a kind of activation fee, with the advantage that you could later on use another phone on it. 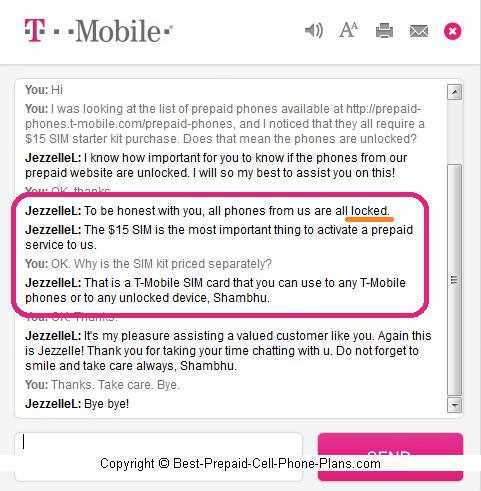 I actually forgot to ask her if there was a way to avoid paying for the starter kit if you already had a t-mobile SIM card from another phone. Basic models include flip phones like the red LG GS170, Samsung T139 and the open-face Nokia 1661. You also have a couple of choices of handsets with QWERTY keyboards. The Sparq offers a sideways-sliding QWERTY keyboard and an FM radio. The Samsung T359 squishes its keyboard into a compact form. The Nokia X2 and the Blackberry 8520 offer traditional vertical keyboard. Finally, there's the latest version of the Sidekick still hanging around. Prepaid Android phones available from T-Mobile include a few 4G models such as various permutations of the Samsung Galaxy and the LG Optimus lines. There are also non-4G smartphones available at lower prices. The phones aren't always in stock. Most starter kits, for the basic phones at least, come with a (wired) hands-free headset and $10 starter airtime. Sometimes there are offers for a bonus refill card with your purchase. Already Got an Unlocked GSM Phone? You can get just a prepaid SIM card and activate your unlocked phone. You get free overnight shipping on these Starter Kits. So buy them online and save on gas. Plus online activation is easy. I just wanted to add a quick note about coverage. 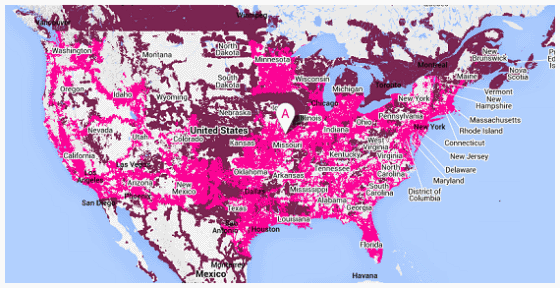 T-Mobile coverage used to be somewhat lacking, but they've improved it. In my case, the area where I used to live used to be in their roaming area, but now has great coverage. You can check your own street-level coverage for on either their 4G LTE network or their traditional network for yourself by punching in your address and zipcode. For example, I used a borrowed T-Mobile phone on a car trip from Western New Jersey to Buffalo, New York. We went through some pretty rural areas, and the coverage and signal strength were quite good. Whether you want to get Gold rewards with the Pay As You Go Plans or choose a smart phones to use with their no annual contract plans, T-Mobile is worth checking out. You can get prepaid phones that use T-Mobile's network from other providers. Platinumtel rebranded itself as PTel and switched from the Sprint to the T-Mobile network. They have pay as you go and monthly plans. The Tracfone, Net10 and Straight Talk family offers some phones that use the T-Mobile network. This page on the smart phone devices they offer breaks it down by network. Simple Mobile, as the name says, requires your to bring you own device to use with their SIM cards. They have monthly plans.